We cling to favorite verses, especially those that offer us comfort, strength, and hope. But real comfort and strength come from right understanding. To borrow from the field of photography, there are two ‘tools’ that help us understand scripture. One is a ‘wide angle lens’ that allows us to see the bigger picture. Another is a ‘zoom lens’ that allows us to examine a verse close up in more detail. Both look at verses in the context of their setting. As a single sentence fits within a paragraph, and a paragraph within a chapter, the single verse that we carry as a banner has contextual meaning that might be different from what you think it does. Have you sometimes been tempted to think this means you will have supernatural abilities to accomplish impossible tasks on your to-do list? Or that, with enough faith you won’t be troubled by the excruciating pressures of life? God might grant you supernatural strength to lift a car off an injured person or to achieve some other formidable task. But this is not the general meaning of this verse. This entry was posted in Faith, Living With Purpose and Passion and tagged Above all else, I can do all things, Jesus above all else, Philippians 4:13, Photography, Secret of being content, Understanding scripture, Wide angle and zoom lenses on January 31, 2015 by Bryan Thayer. The bible is about you. But it’s not all about you. Be assured, the Word of God IS applicable to your life. But it really about God, the history – His Story – of love and redemption, the story of who God is and how He reveals Himself to us and through us. It is indeed the unfolding of His great plan to save the world for His glory. When we inscribe this ‘famous’ verse from the book of Jeremiah onto every greeting card, let’s think about what it means. One interpretation could say, whatever problem you are facing, don’t worry. Got cancer? No worries; God will heal you. Are finances in distress? No problem; God will make it better. Going through a difficult or uncertain chapter of your life? He will ‘prosper’ you with a happy ending. The problem with this interpretation is that Jeremiah 29:11 had nothing to do with our temporary trials. Jeremiah wrote to Jerusalem exiles who had lost everything! They were condemned to live in a foreign land where they would be exiled for 70 years. Think of it. A 70 year exile meant many of them would die in their plight. For some, their children would die there too. God’s promise of “a hope and a future” was a stamp of assurance that His will would prevail and future generations would prosper from it. It wasn’t a guarantee of the fulfillment of everyone’s personal dreams and ambitions. Does this mean that God is unaware of or ambivalent to our woes? Absolutely not. God does have a plan for you and it is a good plan for your hope and future. It might not pan out exactly how you would like. Your pain might continue. Your disease might not be healed. Your relationships might not be restored. Your financial house might fall. He is the one who created you, who knows your heart better than you know yourself. He who gave His only Son to rescue us while we were so undeserving of such a gift. God is the author of compassions that are new every morning. It is He who offers us amazing grace and allows His Holy Spirit to live in those who believe in His Son. He is the great promise keeper and truth teller, the one who never abandons us, who strengthens and equips us. It is He who makes you more than a conqueror and who has written your name forever in the Lamb’s Book of Life if you believe in Jesus. Do you think that He who did not spare His own Son would not also give you all things? God may answer your prayers exactly as you ask. But even if His answer extends beyond your life, He has a plan that give you great hope and a future…a great plan! This entry was posted in Faith, Living With Purpose and Passion and tagged a hope and a future, History is His Story, I know the plans I have for you, Jeremiah 29:11, Understanding scripture on January 30, 2015 by Bryan Thayer. Too many advocate this as the key to great earthly riches and selfish desires. Just ask for money and it will come to you. Ask for the promotion and you will get it. Ask to be healed and your pain will flee from you. Of course, God invites us to pray and seek His will. He does answer prayer, and sometimes in miraculous ways. But is this the proper intent of this passage? Let’s take a look at the context of His message. Ask for these essentials and they will be given to you. Seek after these riches and you will find your joy. Knock at my door, my glory will be revealed to you. This is consistent with what Jesus teaches us throughout scripture: Worship is more important than service (See the story of Mary and Martha). Being a teacher means being able to follow. Being a leader requires having a servant heart. We must be humble to draw close to God. We should not fear losing what we can’t keep in order to gain what we cannot lose. He isn’t saying “Ask for whatever fancies you” though He might grant you that too. More than that, He’s inviting us to ask for His kingdom to come on earth, for us to be filled with the awareness of His joy, His power, His peace, and His love. Aim higher today. Ask for God’s best for you. It’s much more than the lesser things we typically ask for! This entry was posted in Faith, Living With Purpose and Passion and tagged ask and it will be given you, God's best, how to pray, lesser things, Lord's Prayer, Luke 11:9 on January 29, 2015 by Bryan Thayer. We would be well advised to have our thoughts and actions transformed by what the bible says. But I wonder how often we are transformed by what we mistakenly THINK it says. For example, this verse is a frequently misquoted one. What 1 Timothy 6:10 actually says is “the LOVE of money is a root of all kinds of evils.” In this chapter Paul is telling Timothy to adhere to the sound instruction of Jesus. He warns against false teachers who seek personal gain over understanding, teachers who love to seek controversies and quarrels that end in “envy, strife, malicious talk, and constant frictions between people…who have been robbed of the truth and who think that godliness is a means to financial gain.” (v 4-5) His beef is with preachers and teachers who use the gospel as a pretense for personal worldly profit. The rich young ruler was dismayed after talking with Jesus, not because he had too much money, but that it was more important to him than seeking God. But the problem is much larger than money or even the love of it. The root of evil that Paul warns against is desiring and trusting everything else more than God. We say, of course I love God, but I just NEED to have (insert your own heart’s desire). This is the root that grew out of the Garden of Eden after Adam and Eve decided to trust their own thinking instead of trusting God. Money, food, clothes, jobs… none of these things are evil in their own accord. They are each necessities to some sort and in fact, useful for the advancement of the gospel when used according to God’s plan. Money is not the root of all evil. It is the love of money – and everything else we value more than our relationship with God – that is the root of all kinds of evil. Enjoy the good life God intended for you, a life of contentment and freedom from the slavery to things. This entry was posted in Faith, Living With Purpose and Passion and tagged 1 Timothy 6:10, Contentment, love of money, putting God first, root of evil, the good life, Understanding scripture on January 28, 2015 by Bryan Thayer. I think that if a verse of scripture is short enough to fit on a bumper sticker, it is most likely to be misunderstood. Sometimes I have heard this verse interpreted to say that we shouldn’t be concerned about poverty. “Why bother? There are always so many poor people that it is a winless battle!” But is that really what Jesus was saying in this passage? Real understanding comes from examining the context. So what was Jesus saying in this passage? The immediate context shows us that Jesus was defending a woman criticized of anointing him with expensive perfume that could otherwise have been sold and the money given to the poor. Jesus replies, “The poor you will always have with you, and you can help them anytime you want. But you will not always have me.” His focus is on honoring her faith and worship of him, not of diminishing the importance of giving to the poor. In the larger context of this passage, Jesus quotes Deuteronomy 15 which commands Israelites to cancel all debts every seven years. Some people harbored thoughts of contempt, not wishing aid the needy when all debts were about to be canceled. The writer says, “There will always be poor people in the land. Therefore I command you to be open-handed toward your fellow Israelites who are poor and needy in your land.“ (v 11) He wasn’t saying be apathetic to their cause. Quite the opposite, he was commanding the people to give generously to their plight, particularly at an ‘inconvenient’ time when there would assuredly be no repayment. May our lives be living testimony that worship of the one true God compels us to obey His command to “be open-handed” to our fellow man, not just giving them a handout but rather a helping hand, in the same compassion that Jesus showed us. This entry was posted in Faith, Living With Purpose and Passion and tagged Deuteronomy 15, Edward Everett Hale, Jesus, Mark 14:7, obedience, Obeying God, Understanding scripture, Worship, You will always have the poor on January 27, 2015 by Bryan Thayer. Samaritan’s Purse tells the story of Luis, a young boy living in Bolivia. His mother left him with his aunt when he was only three years old. After that, he was passed around from one relative to another, often being left alone while the adults worked, or looked for work. He ended up living on the streets when he was 12 where he found trouble with disreputable friends. His seemed to be a hopeless life, hardened by tough circumstances. We saw this story played out a hundred fold when we were in Bolivia. 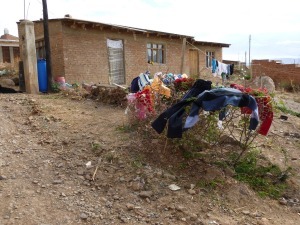 Young children were left in the care of barely older siblings or left all alone while the mother worked and the father, if there was one around, was off for weeks at a time working in the coca fields. 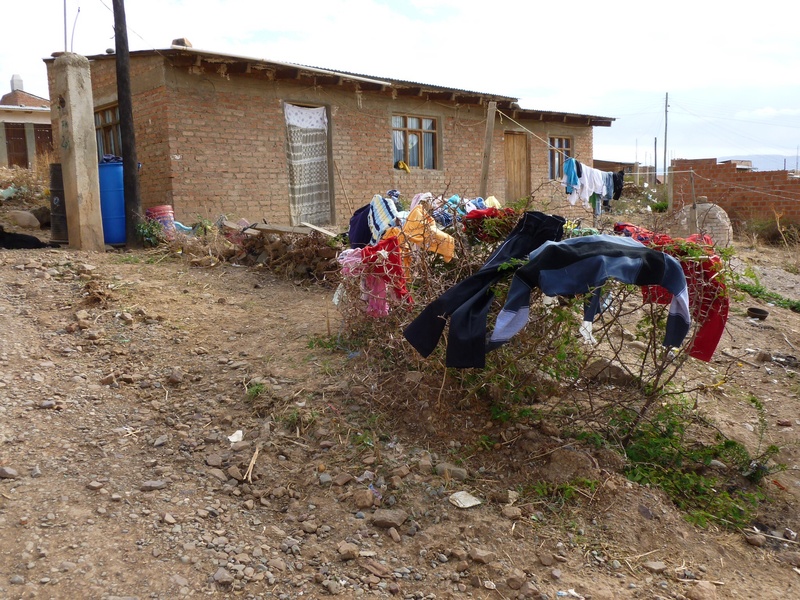 We had joined the CMA church’s outreach program in rural Las Lomas (Ushpa Ushpa). It was a place of dirt and rocks, adobe houses with tin roofs and straw stuck in rafters to keep out the wind. Clothes were set on the few bushes to dry. Water drums set outside the homes as the only source of water, and an outside adobe artisan oven, the source for cooking. Many homes had only curtains for doors. But through the darkness of hopelessness and despair, shines the light of hope, Jesus. 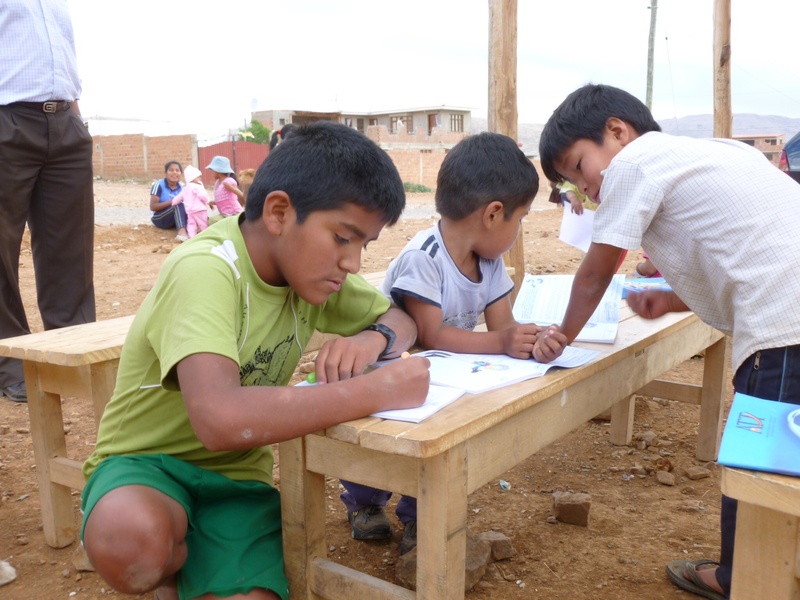 The children we worked with were eager to practice their math, reading and writing skills in their outdoor ‘school.’ We communicated in our broken Spanish, but for many, the presence of a caring adult who cared for them communicated a special language of its own. In addition to their academic work, the children sang bible songs, listened attentively to the bible stories. And they prayed so fervently in their own words when we invited them to pray for their families and their future. 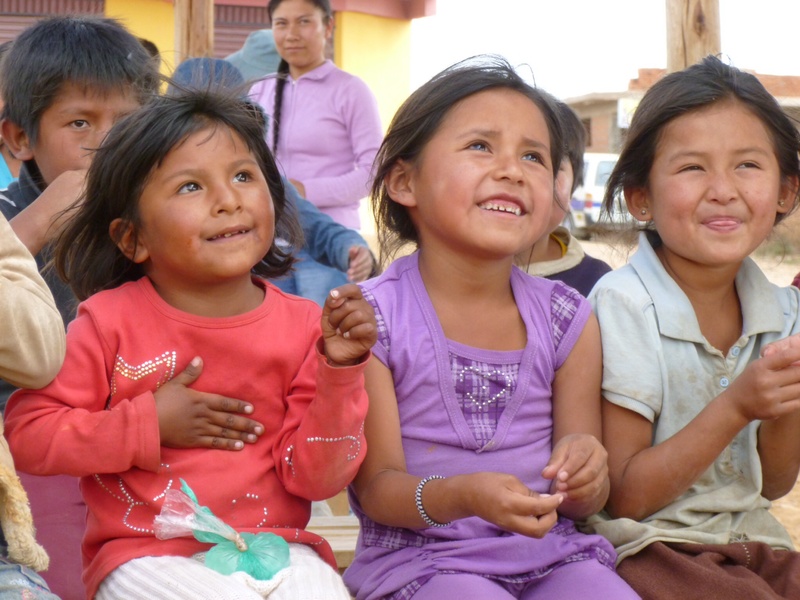 Will you take a moment to pray that Luis and the GLOW ministries with the other lost children of Bolivia will continue to pursue lives that honor Jesus, and not be hardened by harsh circumstances? And will you pray also for our return to the Bolivian mission field this year? Your prayers matter! This entry was posted in Bolivia, Faith, Living With Purpose and Passion, Memories and tagged Bolivia, CMA, GLOW, Las Lomas, literacy, Luis, Samaritan's Purse on January 26, 2015 by Bryan Thayer. I usually keep the posts under 500 words, so you can read them in a few minutes. Hopefully you will come across a truth you want to let soak in throughout the course of your day or week. We encourage you to hold up everything you read (here and elsewhere) to the light of scripture and let scripture build understanding and wisdom. Looking for a post on a specific topic? Just visit the GLOW website: www.GoLightOurWorld.org/blog. In the right margin you will find a blog search engine. Simply enter a word or phrase you want to read about. For example, if you’d like to read a blog citing CS Lewis, just enter Lewis. You can also enter topical words like discern, prayer, hope, a book of the bible, reference (eg Philippians 4:13) or part of the verse using quotes (“I can do all things”). As with all search engines, you’ll get more results with base words like discern instead of discernment or discerning. Be more specific for fewer results. Additionally, you can click on one of the categories links in the right margin. (Note, there are LOTS of posts under the general headings of Faith and Living With Purpose!) Once you get your search results, you may find a shortened version of the post. Just click the post title to read the entire post. We will be changing to a new email delivery system in the coming month or so. If you would like to have the blog posts emailed to you, just send us a note at thayers AT golightourworld.org (leave out the spaces and use @ sign). We promise your address will not be shared with others and we won’t send you spam! Last, if you find the blog posts helpful, don’t keep them to yourself. Help us spread the light. Share the blog and the website link with others and give them a free gift of daily encouragement and challenge. Thanks for reading. Now Go Light Our World! This entry was posted in Living With Purpose and Passion and tagged Blog posts, comments, email delivery, God's strength, hope and purpose, living life well on January 24, 2015 by Bryan Thayer. Is heaven a bunch of malarkey? Alex Malarkey, the guy who wrote “The Boy Who Came Back From Heaven” has confessed. He didn’t die and he didn’t go to heaven. It was in fact a bunch of… well, malarkey. The repentant Alex said he wrote the book with his dad to get attention, and now admits that people should rely on the bible, not grandiose claims, as the source of truth about heaven. I’m glad he repented and came clean about the hoax. And I’m glad he is advising others to read what the bible actually says about heaven to learn about the subject. I wonder how many will take him up on the offer. I remember talking with one friend who said she didn’t want to be bothered with reading the bible; she just wanted to make up her own mind about things. She was in fact, one to judge a book by its cover, not its contents. I wonder if we too sometimes go on with assumptions about something without considering what God actually has to say. When I was growing up, The Family Circle cartoon always portrayed relatives who died as becoming angels who watched over us. Movies like It’s A Wonderful Life portray angels like Clarence Odbody who needed to do a good deed to earn their wings or to pass through the Pearly Gates. Cartoons portray heavenly angels sitting on fluffy clouds strumming their harps and hell as a place where it is all Oreos and no milk. Some people don’t think much about heaven at all, thinking they have plenty of time to get ready. In the parable about the wedding feast, Jesus describes three groups of people: those who refused to come to the banquet, those who ignored or put off the invitation because they had too many ‘more important’ things to do, and those who willingly came to the party. 2. To help others get ready. This entry was posted in Faith, Living With Purpose and Passion, Memories and tagged David Jeremiah, get ready, good deeds, heaven, Heaven is like a party, help others get ready, Malarkey, Matthew 22, myths about heaven, The Boy Who Came back from heaven, wedding banquet, what the bible says about heaven on January 23, 2015 by Bryan Thayer. To hold one thing sometimes you must let another go. We want to have and fill our lives with so many things. You already try to balance work and family, friendships, health, bills, church, devotions, your interests and activities, AND keeping up with Facebook, Twitter and Pinterest. Consider the natural order of things: God, family, others. Maybe it’s time to make room for the truly important things and let something go. When our eyes are constantly focused on what the world has to offer we see ourselves as consumers whose duty it is to follow along. If our focus is on making a living we will probably lose sight of what we make of our lives. If we’re always evaluating ours lives through the eyes of others we miss seeing things through God’s eyes. You catch what you chase. In a similar way, whatever we pursue ends up pursuing and catching us. God says we become a slave to whatever we chase. What parts of your life are being shackled by unnecessary and harmful influences or ‘lesser’ ambitions? Stop chasing them and pursue a closer walk with the God who loves you. Empty your cup to have it filled. We frequently run ourselves dry. We need to be refueled and filled up. But if your cup is already partially filled with stuff that’s harmful – distracting thoughts, deeds, ambitions – you need to empty it out…every day. Then ask God to refresh it, fill it to the brim, and overflowing with His truth and grace. What you give is what you receive. “Love is something if you give it away you end up having more.” But if we give away contempt, bitterness, gossip, apathy, sarcasm and mockery, those things quickly poison our own lives. Be intentional and purposed in handing out goodness, grace, forgiveness, gentleness, kindness, and patience. You are blessed in order to bless. The purpose of our blessing is to bless others, not keep it to ourselves. And blessings most always travel on two-way streets. The blessing you give returns to bless you, perhaps not in the same way or some manner you think it should. But blessings given in God’s name do not return void. You find real victory in surrender. There is a very strong temptation in this unbalanced world to achieve and conquer, to become victorious in every battle. But some battles aren’t meant for us to fight. And in most others we are not called to fight, only to stand firm in God’s Word. If we don’t stand firm in God’s protection we will easily fall for anything and everything. Contrary to worldly ‘wisdom’, the key to victory is in surrendering all your burdens, even your ambitions, to God. He is the only one who can weigh everything in your life and hold them in proper balance. PS- Happy birthday to my wife and best friend! I won’t tell you her age, but I can think of *65* reasons I love this beautiful woman! This entry was posted in Faith, Living With Purpose and Passion and tagged Blessed in order to bless, Empty your cup to have it filled, life balance, To hold one thing let another go, Unconventional wisdom, Victory is found in surrender, What you give is what you receive, Where you look is what you see, You catch what you chase on January 22, 2015 by Bryan Thayer. These truths have been the theme of Go Light Our WorldTM (GLOW) since its inception. Many of our writings have focused on the light of Jesus shining not only into the world, but also into the depths of our own darkness, pain, and sorrow. It is a very personalized aspect of Jesus, the light of the world, illuminating the dark areas of our life, including not only the cross we bear but also shining his convicting light on our sin of wrong doing and wrong believing. His Word is a lamp unto our feet so we don’t stumble. It is a light unto our path so we are not without direction in our lives. What a gracious God we have that cares for us enough to bring us out of our personal darkness. Jesus said, “Come to me and I will give you rest.” But His light, expressed all throughout the gospel, was never intended to be simply a comforter we wrap around ourselves. It is living hope for a desperate and dark world! He says, “You are the light of the world.” Our response is to take His light and run to the darkness. The darkness might not understand the light any more than we fully grasp the light in the darkness of our personal struggles. None the less, the darkness will not overcome the light. Adlai Stevenson, in tribute to Eleanor Roosevelt upon her death said, “It is better to light a candle than to curse the darkness.” Shouldn’t that be our reply as well?! Instead of cursing the darkness in your own life, be it depression, pain, disappointment, or other woe, let the light of Jesus shine in you and it will in turn shine into our world. It is the reason you were created. This entry was posted in Faith, Living With Purpose and Passion and tagged Adlai Stevenson, better to light a candle than to curse the darkness, Carry your candle, Chris Rice, Go Light Our World, Go Light Your World, Good news to the poor, John 15, Let your light shine, Light shines in darkness, Luke 4:18, Matthew 5:14, Matthew 5:15, run to the darkness, set the oppressed free, you are the light of the world on January 21, 2015 by Bryan Thayer.